To the shock, and maybe even ‘awe’, of some of our friends and family, Katie and I chose to spend the winter in the northwest of Washington State this year. Some of this was due to the sale of our house and wanting to take care of things on that end, but it was also because we missed some semblance of winter. We stored our trailer at my parents' house in Salem, OR and after dealing with the house and holidays, we rented a nice guest house at Blanchard Mountain Farm for the month of January. This put us very close to some of our favorite winter birding locations and allowed Katie and I to concentrate on writing and work when we weren’t walking around in our muck boots. We stayed a couple more weeks at the Samish Island Pioneer House in February to continue our time in the area. After that we spent some time in Bellingham; Vancouver, BC; Duvall; and Seattle before heading south to my parents' home in Salem to start preparing our trailer for spring. One of my goals was to spend time with the short-eared owls that frequent the Stillaguamish, Skagit, and Samish Flats. Unfortunately, their population in the area was much lower than my experience in previous years. Spending as much time as we did made it at least possible to see the few that were around. There were plenty of other regulars, though, and the rain was the only factor limiting our time in the muddy terrain. Skagit County in Washington State is an area that Katie and I have been interested in for a while now, specifically, the Skagit and Samish Flats regions. These are former saltmarsh river deltas that were transformed into soggy farmlands by enterprising Dutch settlers who, undeterred by soggy lands, built an extensive dike system around the whole area. Unsurprisingly, the area is well known for its tulip fields, but many other monocrops are raised in the area such as potatoes and blueberries. The land is predominantly privately owned and mostly farmed. While it is hard to imagine what the original salt marsh was like and the numbers of species that called it home, the current configuration is no stranger to wintering birds. 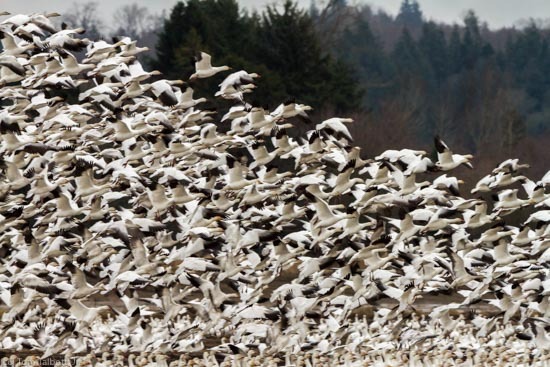 Popular for snow geese, trumpeter swans, and large numbers of ducks, it is also a gathering place for eagles, falcons, hawks, and owls. Because of this, fall and winter draw increasing numbers of hunters and bird watchers. The little town of Edison can be completely overrun by cars on the weekend. Unfortunately, there are only a few places that are publicly accessible to hunters or others interested in this abundance of wildlife. Some private lands accommodate hunters, otherwise, the only places for visitors who come for the wildlife show are road shoulders or the few state lands that are open. One of the areas that I visited frequently is locally known as “West 90”, but, officially, it is designated by the Washington Department of Fish and Wildlife as the Skagit Wildlife Area, Samish Unit. Nearby is “East 90”, or the Samish River Unit. West 90 is popular with hunters, birders, and dog walkers during the fall and winter months. Hunters technically are the favored population during this time since the land is mostly maintained for them. The lack of other open space, though, means that other users, including myself, encroach on the hunters and the land tends to be somewhat crowded. Because of all of these users, there tend to be few ducks, swans, or geese around during hunting season, but a number of birds of prey hang out, especially eagles. The eagles do a good job of cleaning up the injured geese or ducks that hunters, or their dogs, miss. At the end of January, the decoys, duck calls, and fire sticks make like ground squirrels and abandon the fields, returning to their burrows in garages and storage lockers for the next nine months waiting to emerge again next fall to fulfill their destiny. In their place, real ducks flock back to the fields, swans return, and a more natural ecology begins to take shape. The numbers of birds that return to the area is pretty impressive. Ducks are still anxious and fly off as I walk around, but I know it will be easy for them to find a place that feels safe. Snow geese still circle around testing for gunshots. Eventually, these concerns will ease and they can concentrate on the wild predators in the area. Flooding during this time of year is common as weather patterns drop snow in the mountains and then rain that combines with snow runoff to fill the rivers. A portion of the Samish River dike gave way and flooded many fields to the west of the river making lakes that were filled with thrilled ducks and swans. For me, it was a foreshadowing of issues facing the area in the upcoming decades. The Samish and Skagit Flats are flood plains. We changed the ecology of the region to facilitate farming, but there are new pressures that are beginning to affect the area. Population growth is one pressure as areas around the Puget Sound continue to become too expensive and hectic. Outside of a few towns like Mt. Vernon and Burlington, the flats themselves are mostly farmland, which limits available housing. So far, I haven't seen any of the big apartment complexes that you see in areas like the Snoqualmie Valley or the outskirts of the Bay Area in California spreading like lava flows scouring fertile land. Up north, the sleepy city of Bellingham is definitely seeing new growth as people leaving Seattle move in, and it seems more than likely that these same pressures will affect the flats eventually. Another pressure that this area will undergo is increased flooding due to rising sea levels and, possibly, increased precipitation. Some areas have been, or are being, “returned” to a more “natural” tidal state by breaching dikes that are too expensive to maintain. These natural areas are transforming into a third ecosystem that somewhat reflects the pre-farm era, but is really a whole new system that is still being managed. It is likely that over the decades more of these lands will be “returned” as dikes age and farms become too expensive to operate. It will be interesting to see how this area adjusts to these pressures over the next couple of decades and what new ecosystem will arise out of it all.